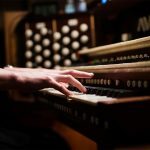 In addition to seeing the Passion Pay in Oberammergau as part of our 2020 pilgrimage, we will be visiting the beautiful shrine of Our Lady of Altötting. 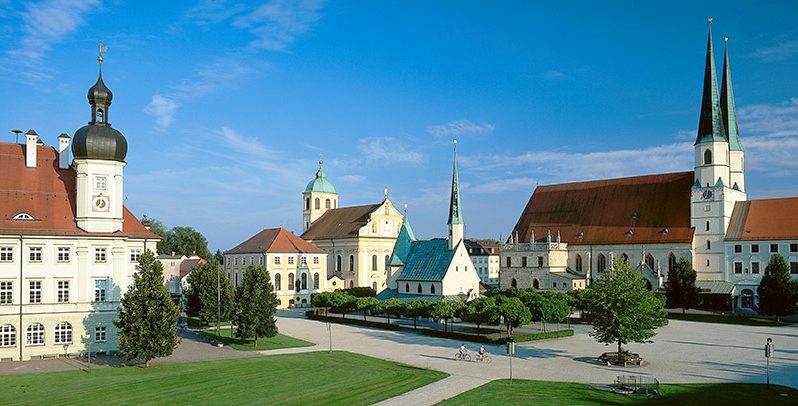 Altötting is one of the oldest and most famous places of Marian pilgrimage in Bavaria. The shrine’s origins go back to the 7th Century. The octagonal chapel (the so called “Gnadenkapelle” – “chapel of grace”) where the image of Our Lady of Altötting is venerated dates to 660 AD. However, the town’s reputation as a place of pilgrimage only took off after an incident in 1489. In that year a 13 year old boy from the town drowned in the river. When the mother placed his lifeless body in front of a statue of Our Lady which was housed in the small octagonal chapel, he miraculously came back to life. The shrine’s fame then spread as more and more pilgrims came to leave their petitions at our Lady’s feet, and the large pilgrimage church which now stands there was built around the original lowly chapel. 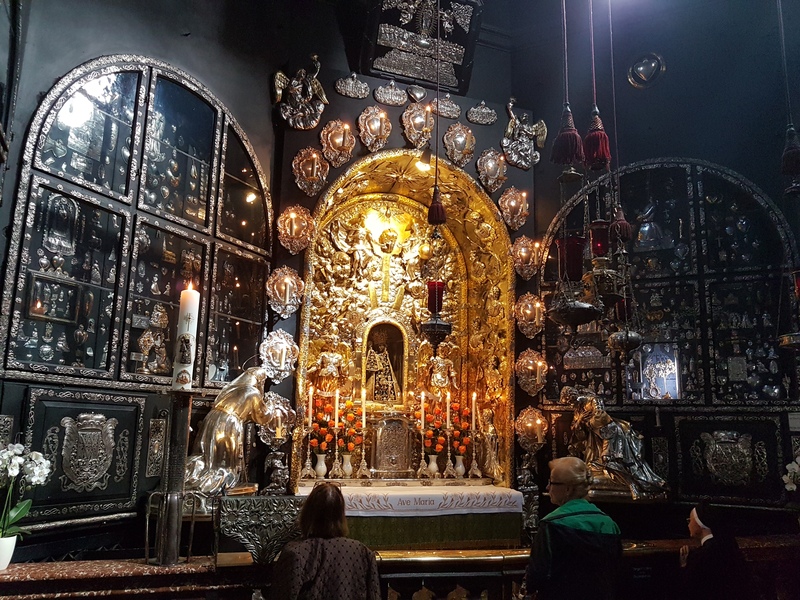 The Gnadenkapelle Holy House is a beautiful mixture of stunning baroque silver work with monuments to the famous alongside the votif and thank offerings left by centuries of ordinary pilgrims. At the heart of it all lies the tiny statue made of linden wood of Our Lady. Altötting is so important to the history of Bavaria and the piety of its people, that the tradition emerged of burying the hearts of its Wittelsbach rulers here. 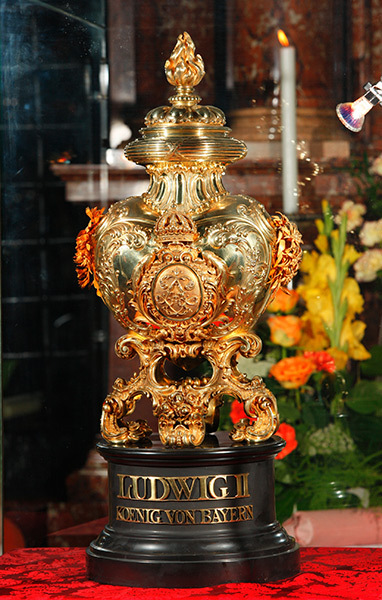 One can see, for example, the heart of King Ludwig II encased in a beautiful silver urn. 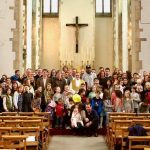 We can not wait to visit Altötting, and bring our pilgrim petitions to Our Lady there. 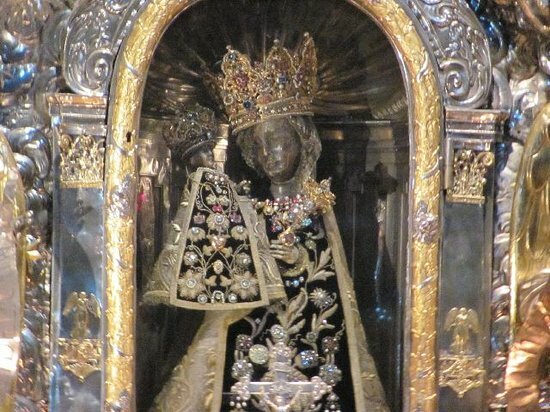 May Our Lady of Altötting continue to bless an protect the people of Bavaria, and may she pray for all those who visit her shrine on this pilgrimage! Details of our planned pilgrimage and application forms can be found here. The beautiful shrine sanctuary of Altötting.